UPDATE! Thanks to all your support we've already reached our target so we have added a stretch target to be able to afford both screens. See details below. Pledge now! Help us to get £250 in match funding from Rocket Fund, by being one of the first groups to raise £250. 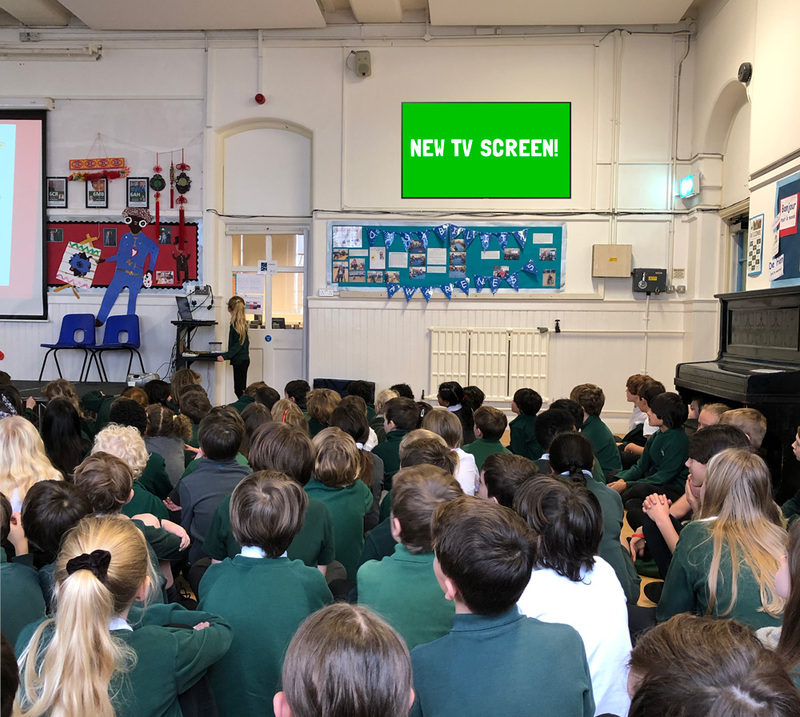 Over the last few years Stanford Junior School PTFA have helped provide 12 interactive TV screens for individual classrooms, but now the school is in need of new technology for the main hall. 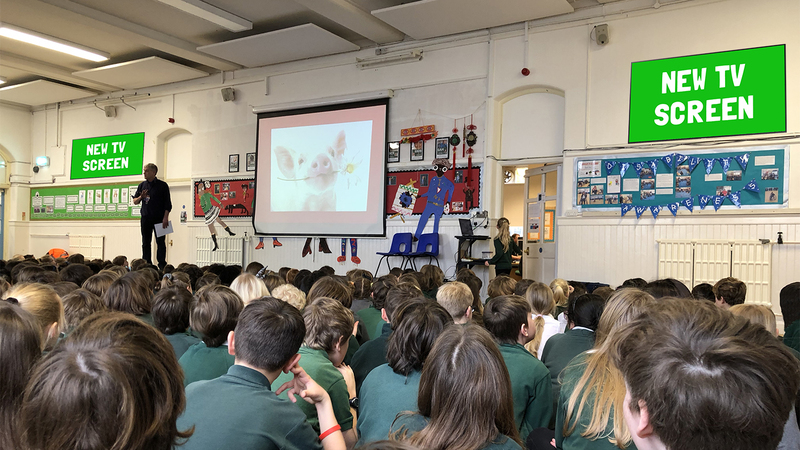 The long, thin hall layout means that during assemblies and presentations, not all children can see the screen properly. The addition of two TV screens mounted on the walls would mean that the children at each edge of the hall could look forward rather than sitting sideways and struggling to see. We want to install two 75" TV screens on the walls at either end of the hall, which will mirror the content of the projector screen in the centre of the hall. The screens will be used by the whole school during assemblies, for classes and for events such as school shows. The screens are also used for PTFA events such as Film Night - these additional screens will enhance the experience for everyone. The PTFA want to raise enough money to buy and install one screen. If we can raise enough funds, the school have agreed to buy and install the second screen. Now that we've raised enough to buy and fit 1 screen (thanks again to all our supporters! ), the school has agreed to pay for the other. 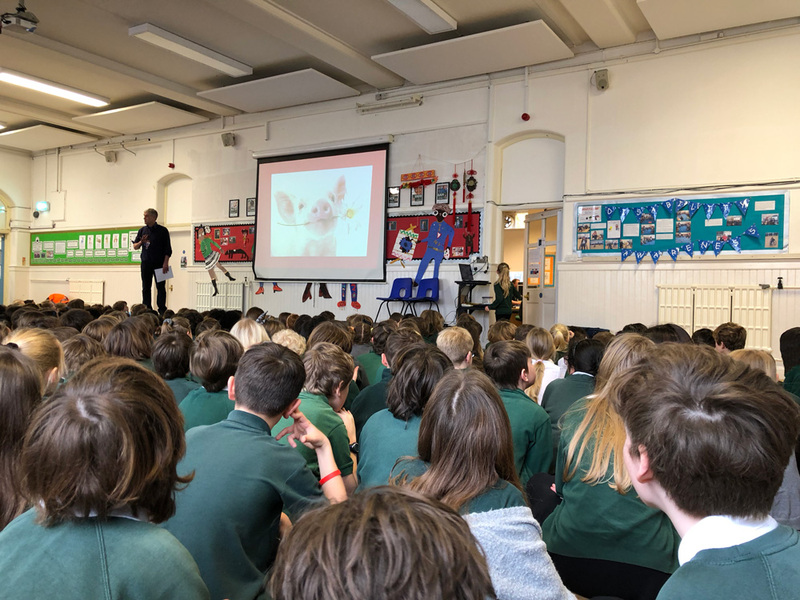 However, we'd love to be able to raise all the money needed for both screens (and let the school spend their money on something else to benefit the kids), so we're going for the full £3,000. Please do donate, but if you can't donate right now you can help us in other ways! Please share this project with anyone you think would support us. Share the link at the top of the page on Twitter, Facebook, email, your website, blog, mention us in a phone call or even just a chat over the fence. Please support us and help make a difference to our pupils! A Thank You shout out on our Facebook page and Twitter. A hand-drawn Thank You postcard designed by one of the pupils. This will look great on your fridge! A kids tickets for the next PTFA event, a complimentary drink in the Stanford Arms (ie the PTFA Bar) and a hand drawn Thank You postcard from one of the pupils.